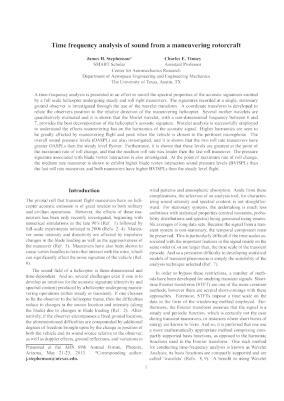 Abstract: A time-frequency analysis is presented in an effort to unveil the spectral properties of the acoustic signatures emittedby a full scale helicopter undergoing steady, roll right maneuvers. The signatures recorded at a single, stationaryground observer is investigated through the use of the wavelet transform. A coordinate transform is developed torelate the observers position to the relative direction of the maneuvering helicopter. Several mother wavelets arequantitatively evaluated, it is shown that the Morlet wavelet, with a non-dimensional frequency between 6,7, provides the best decomposition of the helicopter’s acoustic signature. Wavelet analysis is successfully employedto understand the effects maneuvering has on the harmonics of the acoustic signal. Higher harmonics are seen tobe greatly affected by maneuvering flight, peak when the vehicle is closest to the pertinent microphone. Theoverall sound pressure levels (OASPL) are also investigated,, it is shown that the two roll rate maneuvers havegreater OASPLs then the steady level flyover. Furthermore, it is shown that these levels are greatest at the point ofthe maximum rate of roll change,, that the medium roll rate was louder then the fast roll maneuver. The pressuresignature associated with blade vortex interaction is also investigated. At the point of maximum rate of roll change,the medium rate maneuver is shown to exhibit higher blade vortex interaction sound pressure levels (BVISPL) thanthe fast roll rate maneuver,, both maneuvers have higher BVISPLs then the steady level flight. 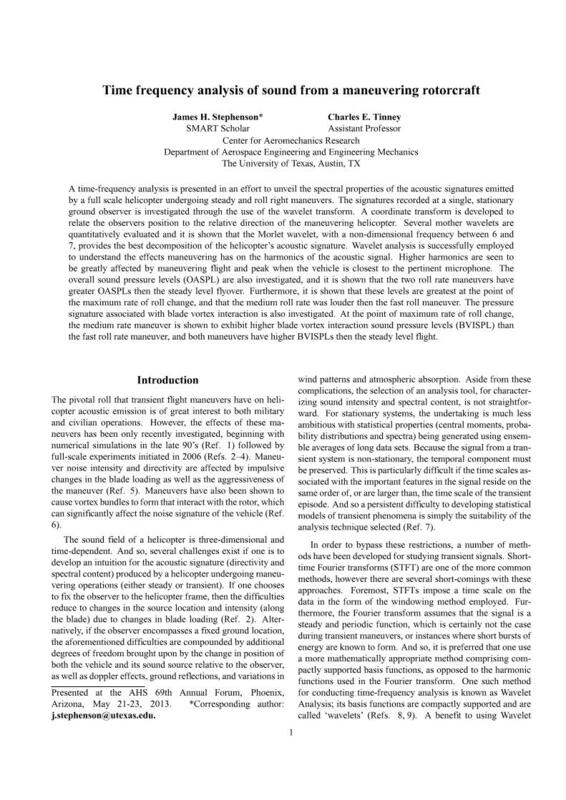 Abstract: A time-frequency analysis is presented in an effort to unveil the spectral properties of the acoustic signatures emittedby a full scale helicopter undergoing steady and roll right maneuvers. The signatures recorded at a single, stationaryground observer is investigated through the use of the wavelet transform. A coordinate transform is developed torelate the observers position to the relative direction of the maneuvering helicopter. Several mother wavelets arequantitatively evaluated and it is shown that the Morlet wavelet, with a non-dimensional frequency between 6 and7, provides the best decomposition of the helicopter’s acoustic signature. Wavelet analysis is successfully employedto understand the effects maneuvering has on the harmonics of the acoustic signal. Higher harmonics are seen tobe greatly affected by maneuvering flight and peak when the vehicle is closest to the pertinent microphone. Theoverall sound pressure levels (OASPL) are also investigated, and it is shown that the two roll rate maneuvers havegreater OASPLs then the steady level flyover. Furthermore, it is shown that these levels are greatest at the point ofthe maximum rate of roll change, and that the medium roll rate was louder then the fast roll maneuver. The pressuresignature associated with blade vortex interaction is also investigated. At the point of maximum rate of roll change,the medium rate maneuver is shown to exhibit higher blade vortex interaction sound pressure levels (BVISPL) thanthe fast roll rate maneuver, and both maneuvers have higher BVISPLs then the steady level flight.